The Bachelor of Business Administration with Honours in Financial Technology and Innovation is a 4-year degree programme. Applicants can apply for admission to Year 1 or Senior Year. The programme is designed to provide students with quality education in theoretical and practical knowledge and skills to apply technological innovations to a changing business environment, especially financial services industry, so as to equip them to take up positions of responsibility, leadership and consultancy in financial services industry. Graduates can take up various positions ranging from entry to senior level in financial services industry. 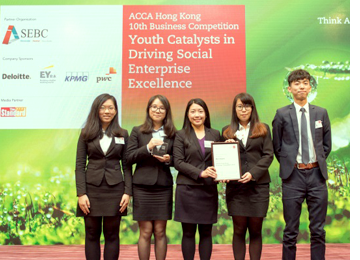 A team of four accounting students participated in the ACCA Hong Kong Business Competition. After rounds of competition, the OUHK team won the merit award in the final 7 teams out of over 400 teams.